In Part I of this two-part series, we discussed four key factors to consider in preparing for plugging into international power: line frequency, nominal voltage, voltage fluctuations, and physical connection requirements. In Part II, we&apos;ll look at three approaches to preparing your boat for connecting to international shorepower, and we&apos;ll outline the advantages and disadvantages of each. 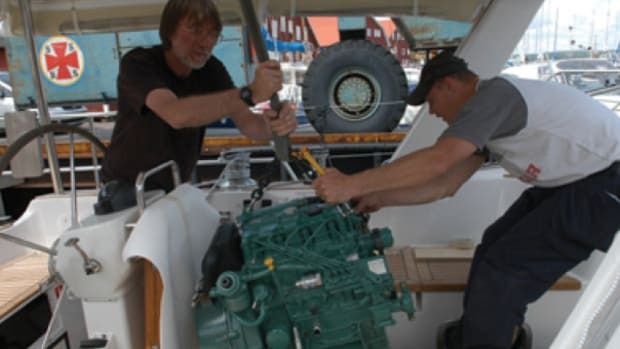 The first approach to preparing your boat for connecting to shorepower overseas is finding "power-tolerant" equipment. If you&apos;re careful and selective, it is possible to locate equipment that will run on most international power. Be sure to check the specifications for frequency range as well as voltage. Many of the small plug-in transformers that we use to power our laptop computers, digital cameras, and cell phones, for example, will run on just about any power from about 100 to 250 volts and 50 or 60Hz. Check the labels carefully. Most heating appliances (such as electric heaters, electric skillets, and toasters) don&apos;t really care what frequency they run on, although they typically require a fairly narrow range of operating voltage. Be careful, however, if the appliance has a heating element and a motor, since the heating element will probably work fine on 50Hz or 60Hz, but the motor may not. A hair dryer is one example of such an appliance. Some devices with electric motors will run on 50Hz or 60Hz, but they&apos;ll run slower on 50Hz and might be a bit less efficient. For example, the air conditioning system on our trawler will operate on either frequency, but it runs a bit slower on 50Hz, since this type of motor depends on the line frequency to determine its speed. Don&apos;t forget to consider your battery chargers and other permanently installed equipment. This equipment must also be selected to handle both frequencies if you are taking this approach to shorepower preparation. The key in selecting equipment is to read the specifications carefully. If you elect this approach, you&apos;ll probably also need a transformer to convert shorepower voltages into the correct range for your equipment (i.e., down from 240 volts to 120 volts or up from 120 to 240 volts). Some transformers have "taps" that allow you to configure the transformer to "step up" or "step down" the shorepower voltage by changing the input and output connections with either some manual rewiring or a switch. Another useful feature is an automatic "boost" function that will provide some automatic compensation for line voltage fluctuations. 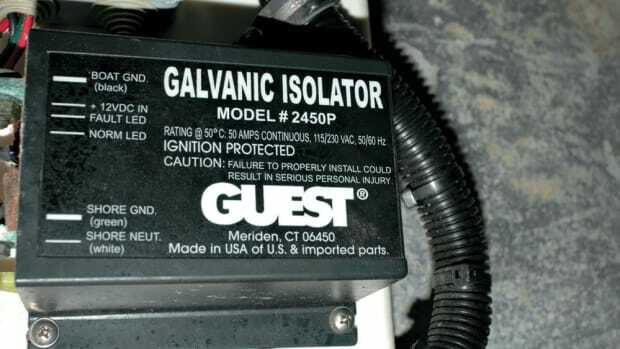 There are important safety reasons for installing an isolation transformer anyway, so if you&apos;re cruising to areas with different line voltages, consider a transformer with taps and a boost function so that it can handle a variety of input voltages and help isolate your boat from some of the fluctuations of the incoming shorepower. Remember that if you&apos;re cruising in areas with different shorepower frequency than your home, the transformer must be specified to work with 50Hz or 60Hz. Running a transformer designed for 60Hz on a lower frequency will cause it to draw more current and run hotter, so be sure that the transformer is designed to work with 50Hz or 60Hz. Also, the transformer will not convert the frequency. Whatever line frequency is on its input will be reflected in the output. The advantage of the "power-tolerant equipment" approach to shorepower management is that it generally costs less (although equipment that will run on different frequencies and line voltages may be more expensive than more common models). The disadvantage to this approach is that you must be extremely careful about keeping track of what equipment can be safely operated on the shorepower you&apos;re currently connected to. It&apos;s easy to forget and plug something in that won&apos;t handle 50Hz power or different voltages. All of your permanently installed equipment must either handle the various shorepower inputs or be disconnected. You should install covers over critical circuit breakers to avoid accidentally turning on devices with incompatible power. Also, keep in mind that many electronic devices, such as TVs and computers, must not be connected to incompatible power, even if they&apos;re left off. Many electronic devices are actually in a "standby" mode when they&apos;re switched off. These devices must be completely disconnected or shut off at a circuit breaker. Another approach is to simply not depend on the shorepower supplies at all and to run an onboard generator whenever local shorepower is incompatible with your equipment. Of course, running your generator 24/7 is expensive and won&apos;t do much for your reputation at the dock. Also, prolonged operation of your generator at load levels below about 70 percent of its rated capacity can cause a variety of long-term problems, so it&apos;s not advisable. Making your own AC power with an inverter may be more practical-at least for reasonably small loads, up to about 4kW (which equates roughly to 30 amps at 120 volts). Larger inverters are also available, and some models allow you to gang several inverters together to increase capacity. Remember, however, that every amp of 120VAC power that you use from an inverter requires 12-15 times that many amps at 12 volts or six to seven times that many amps at 24 volts to run the inverter. A 1,500-watt appliance operating on an inverter will use around 140 amps at 12 volts and 70 amps at 24 volts. At those rates, it doesn&apos;t take long to discharge even a substantial house battery bank. In addition, motor-driven appliances such as refrigerators and air conditioners often require several times their normal operating current for a brief period at start-up. Fortunately, most inverters can also provide brief surges of additional power above their continuous rating. Be sure to account for these start-up loads when you calculate the amount of inverter capacity you need. If several motors start simultaneously (as may happen when you turn on a multi-zone air conditioning system, for example), the system may draw a huge start-up current as several compressor and fan motors try to start simultaneously. You&apos;ll also need a big house battery bank and/or large battery chargers to replenish all those amps you use. If you use your generator to charge batteries, you&apos;ll need to be sure that your house battery bank is large enough to handle the inverter loads over the period of an evening when you can&apos;t (or don&apos;t want to) run the generator. When you do start the generator, you want to be able to recharge the batteries in a reasonable period of time. The rule of thumb is that your charging sources need to be able to supply at least 20 percent of the amp-hour capacity of your battery bank. For a 1,200Ah battery bank, you&apos;ll want at least 240 amps of charging capacity. Early inverters and many of today&apos;s smaller, low-cost inverters generate a "modified sine wave" output, instead of a pure sine wave. While many AC-powered devices will work fine on these inverters, there are several disadvantages to modified sine wave inverters, including substantially increased radio-frequency noise that can be very detrimental to the performance of radios, TVs, and other sensitive electronics. For most cruising boats, the extra cost of a pure sine wave inverter is well worth the investment. If your battery chargers will run on 50Hz or 60Hz, you may be able to run them on shorepower and use one or more inverters to create the appropriate power for your onboard AC power needs. You can run your battery chargers on 50Hz/240-volt shorepower and produce 60Hz/120-volt AC power from your inverters for your appliances. Short-term peak loads can draw power from the batteries, and as long as your inverter capacity is large enough, the output voltage should be quite stable and independent of shorepower line voltage fluctuations. If you plan to run your system in this mode over extended periods, the battery chargers must be capable of supplying enough current to stay ahead of the average demand from the inverters and recharge the batteries after periods of peak demand. Figure 1 shows a simplified diagram of a typical battery charger/inverter setup. This system requires an isolation transformer that can handle 50 or 60Hz input, as well as a battery charger with the same capability. Using a 240-volt battery charger works best because 220- to 240-volt shorepower is more common around the world than the lower 120 volts. If the isolation transformer has a center tap on the input winding, as shown in Figure 1, you can also add a switch that takes advantage of the center tap to step up 120-volt input to 240 volts. You might also want to consider an isolation transformer with boost capability so that your system will be able to handle lower voltages (such as the less common 208-volt power) and help compensate for line voltage fluctuations. Keep in mind, however, than when you plug into 120-volt outlets using the transformer center tap, it takes twice as many amps to create the same total power as when you&apos;re plugged into 240 volts. As a result, you&apos;ll probably want to make sure you have the ability to control the amount of current your battery charger uses to avoid tripping the circuit breaker on the dock. Many modern battery chargers have functions that allow you to throttle the battery chargers to limit the amount of power they use. Of course, this also limits the amount of AC power you can use from the inverters over the long term, because the battery charger must be able to replace all that power in the battery bank. Figure 1. A simplified diagram of a battery charger/inverter setup for creating stable 60Hz power from 50Hz or 60Hz shorepower. Many boats have combined battery charger and inverter units installed because these are less expensive and take up less space than separate units. This works great where the available shorepower is compatible with your onboard electrical requirements. Usually, when there is shorepower present, these combined units simply "pass through" the shorepower. Some may be capable of supplementing the shorepower, adding inverter power to the shorepower to handle temporary load peaks. However, most of these combined charger/inverters cannot be run as a charger and inverter simultaneously with different frequencies on the input and output. For example, you generally can&apos;t plug your boat into 50Hz shorepower and expect your combination charger/inverter to put out 60Hz AC. If you want to generate your own alternating current using inverters and also charge your batteries using battery chargers that will run on 50Hz or 60Hz, you&apos;ll need to install separate charger and inverter units, and you&apos;ll need to ensure that the boat&apos;s internal AC loads are connected only to the inverter outputs- not to shorepower. Some appliances, such as air conditioning systems, may be capable of operating on 50Hz power, so you can run these systems directly on shorepower while running other frequency- and voltage-sensitive devices on the inverters. Most boats will have at least one inverter installed for use at anchor when not running the generator, so at least some part of the system may already exist on board. If the inverter is a combination charger/inverter, it is possible to install a separate charger and disable the charger part of the inverter/charger so that it never attempts to pass through power with an inappropriate frequency. Assuming there&apos;s sufficient power available in your battery bank and your inverters are sufficient to handle your onboard AC requirements, the line voltage and frequency on board will be impervious to voltage or frequency fluctuations in the shorepower. This system can be used seamlessly without AC power interruption whether you&apos;re plugged into shorepower or not. Of course, you&apos;ll have to charge the batteries sooner or later, either with battery chargers that can handle the local shorepower or by running your generator. This system is a bit less efficient than other approaches because you have the inefficiency of the battery charger and the inverters combined. Large inverters or multiple inverters may be required for higher power loads. While loads that run on the inverter are protected from line voltage fluctuations and other anomalies in the shorepower, any loads that run directly on the shorepower (via the isolation transformer) are still subject to the vagaries of shorepower fluctuations. A boost function in the isolation transformer can take care of some of this, but it won&apos;t provide full protection from spikes and over-voltage conditions. Several companies produce specialty shorepower converter devices that are specifically designed to accept a wide variety of shorepower frequency and voltage and convert it to a constant voltage and frequency for use on board. The converters accept the AC input from shorepower and convert it to DC power internally. Then, a built-in high-efficiency inverter takes the DC power and creates your desired AC output voltage and frequency. Initially, these units were only practical on very large yachts with large power requirements and equally large budgets. However, in recent years shorepower converters have come down in size and cost, and microprocessor technology makes them increasingly intelligent. Some are even able to automatically start generators when input shorepower fails or falls below certain thresholds, and automatically restart themselves when shorepower is restored after a failure. They&apos;re still not cheap, but converters offer the most flexible universal power conversion option. Typically, shorepower converters will accept a wide variety of input voltages from about 170 volts to nearly 500 volts and input frequencies from about 40Hz to 70Hz. The output frequency and voltage are usually fixed and configured at the factory. Converters handle all three of the main shorepower variables: frequency conversion, converting the nominal line voltage to a stable desired voltage, and isolating onboard systems from voltage fluctuations in the shorepower. In addition, most have built-in isolation, so they provide the same safety and galvanic-corrosion protection as an isolation transformer. A shorepower converter provides the most robust and efficient means of converting a wide variety of shorepower to a stable AC power source that is compatible with your onboard equipment. It protects onboard equipment from virtually all types of shorepower anomalies, including under- and over-voltage conditions and spikes that are common in some areas of the world. There&apos;s minimal risk of damaging onboard equipment and systems by plugging into incompatible shorepower, since the converter will handle most shorepower configurations you&apos;ll find worldwide. If the input power is within the voltage and frequency range for the converter, it will generate a stable output as the desired voltage and frequency. Otherwise, it will not start at all. The shorepower converter provides the same isolation benefits and voltage-boost capability of an isolation transformer, in addition to its power conversion functions. You can expect to pay three to four times what you would pay for a similarly sized isolation transformer with boost capability. A converter may be noisier, because it usually has cooling fans, whereas an isolation transformer typically does not. Most converters will not run on 120-volt shorepower. The lower limit of most converters is around 170 volts. If your cruising plans include destinations that have only 120-volt shorepower available, you&apos;ll need a fallback solution for these locations. When we had our 60-foot Selene trawler built, we studied several options for preparing for international power. Our goal was to create a flexible shorepower system that would handle worldwide shorepower while offering as much redundancy as possible within our budget and space constraints. As is often the case on vessels with air conditioning or other large loads, our Selene was equipped from the factory with two 50-amp shorepower circuits. Typically, one circuit is intended to power the air conditioning systems, and the other powers the remainder of the loads. Because our air conditioning systems can operate on 50 or 60Hz power, we decided to install a simple 50Hz/60Hz isolation transformer on one of the shorepower circuits. We installed an ASEA Power Systems 12kVa power converter on the second shorepower circuit. To provide redundancy, we added crossover switches that allow both the isolation transformer and the frequency converter to be connected to either of the shorepower circuits. Figure 2 shows a simplified diagram of our system. If we are at a dock with abundant 50Hz or 60Hz shorepower, we can run the air conditioning through the isolation transformer on one of the 50-amp circuits, and the rest of the house loads on the second circuit. In addition, the AC circuit breaker panel is split into two halves, "A" and "B." Each half of the panel can be powered by the output of the shorepower converter, the isolation transformer, or the generator. If the shorepower converter were to fail, all the loads could be switched to the isolation transformer (obviously, within the limitations of the single 50-amp circuit) or the generator. We installed two independent battery chargers- one tied to each of the "A" and "B" shorepower circuits- as well as two 4kW inverters for powering 120-volt loads while we&apos;re at anchor without the generator running. All of the 120-volt loads can be run either on the inverters or directly on the AC output from the frequency converter or isolation transformer (for simplicity, switching for the 120VAC loads is not shown in the Figure 2 diagram). Since the battery chargers and isolation transformer can operate on either 50Hz or 60Hz input power, they provide a backup for the shorepower converter. If the converter fails, 120-volt loads can run off the inverters, while the battery chargers, running through the isolation transformer, will maintain the battery charge level. We&apos;ve installed an isolation transformer with a center tap and switching, similar to the setup shown in Figure 1, for locations that have only 120-volt power. For clarity, that switching is omitted in Figure 2. Both diagrams also omit numerous circuit breakers in the system that provide over-current protection. Figure 2. A simplified diagram of the shorepower system on our Selene 60. Preparing your boat for international shorepower is one of those instances in which Ben Franklin&apos;s famous quote truly applies: "An ounce of prevention is worth a pound of cure." While sorting through the options and details may not be a lot of fun, taking the time to work through these issues now will certainly make life easier and more fun when you pull into that beautiful marina in paradise and want to plug in to chill the drinks. Since there are many critical safety requirements for shorepower systems, the design and installation details are best left to qualified engineers and technicians. However, armed with the concepts and options discussed here, you should be able to have a productive conversation with your builder, engineer, or boatyard and make an informed decision about the best option for your boat, your equipment, and your cruising plans.